Amazing women and men of the Bible come to life through age-appropriate puzzles, activity pages, and 50 reusable stickers in these friendly and fun sticker and activity book featuring The Beginner's Bible classic art and simply written content. Children will love learning about Deborah, Ruth and Naomi, Queen Esther and more as they delight in the stories, art, and activities in The Beginner's Bible Super Girls and Boys from the Bible Sticker and Activity Book. The Beginner's Bible Boys & Girls Sticker bundle by Illustrated by Kelly Pulley, Zondervan Publishing was published by Eden bundles in January 2019 and is our 11782nd best seller. The ISBN for The Beginner's Bible Boys & Girls Sticker bundle is EDENBUNDLE-2267. 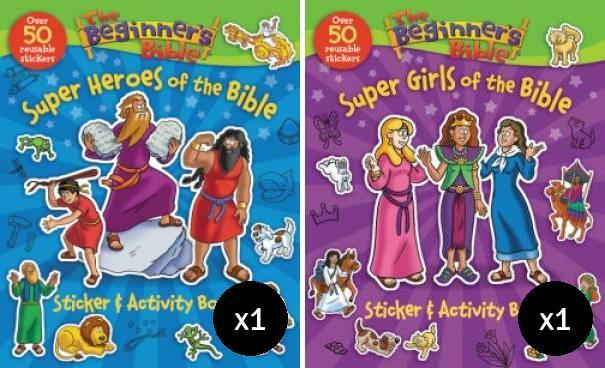 Be the first to review The Beginner's Bible Boys & Girls Sticker bundle! Got a question? No problem! Just click here to ask us about The Beginner's Bible Boys & Girls Sticker bundle.